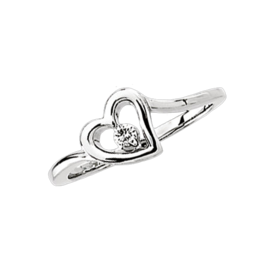 Pretty 14k White gold diamond heart promise ring. This ring is set with a 2.5mm round .06ct tw diamond. Stock size 6. We are happy to size this ring for you, simply put your size in the comment box during checkout. Fantastic 14k White gold 2ct tw diamond ring. Diamonds are round .04 and .05ct each, there are 40 stones in this ring. Diamond ring weighs 7.9grams. 14k White gold diamond ring. Diamonds total 1/2 carat in this diamond ring. 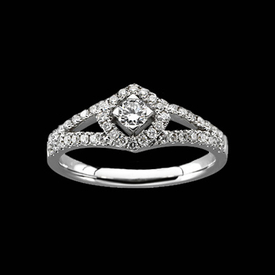 Center diamond sits in a square design and is accented both sides and in a border with accent diamonds. Great ring. 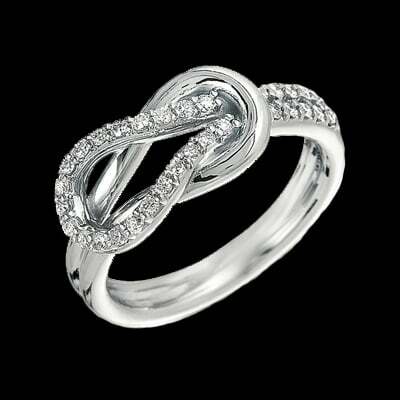 Pretty 14k White gold diamond love knot ring. Diamonds are SI clarity G-H color and total .28ct tw in this ring. Stock size 7. Free custom sizing, add your size to the customer comment box during checkout. 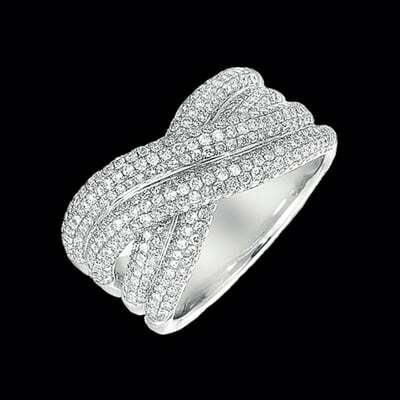 Incredible 14k White gold dual swirls diamond ring. This ring features 2 pear shape diamonds SI 1 clarity G color each totaling .62ct for the pair. Round diamonds through out the remainder of the ring total .94ct tw and are also SI 1 clarity G in color, diamonds total 1.56ct tw for this ring. 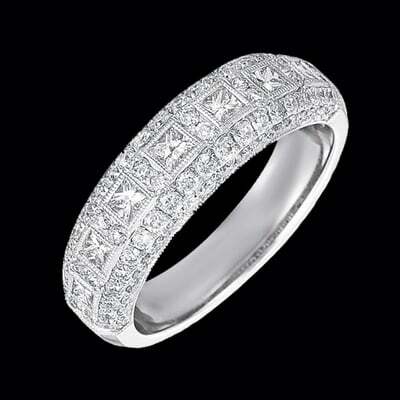 14k White gold Pave diamond band. This diamond band is beautiful, wear it as your wedding band or just because you love the dazzling look of pave diamonds. Diamonds are SI 1 clarity G color and total .68ct tw in this design. 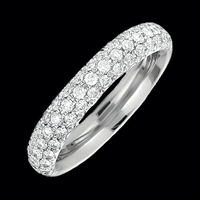 There are 52 diamonds in this 14k white gold pave diamond band. We have many lovely Pave diamond rings. Sizing available at additional cost and time frame. Email for pricing. 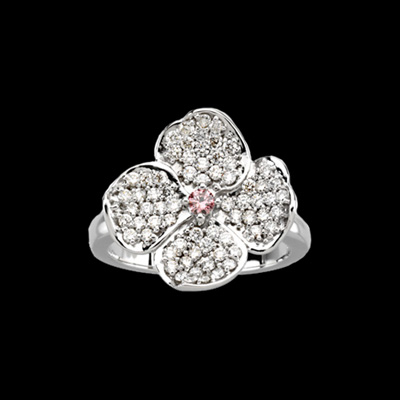 Beautiful 14k white gold diamond floral ring. Lovely pink center is a pink diamond. White diamonds are pave set and fill each petal for a .74ctw. (including center) Diamonds are SI 1 clarity G-H in color. Very pretty ring. 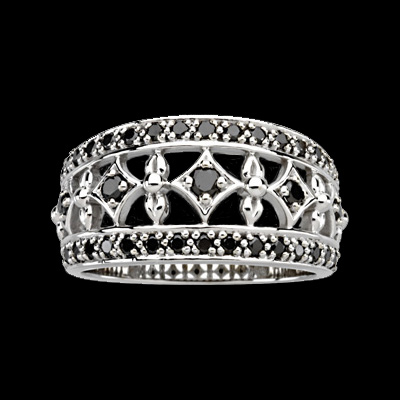 Etruscan inspired 14k white gold black diamond ring. Black diamonds total 1/2 carat. This ring is powerful, sophisticated in design. For elegance that never goes out of style, try this or one of our other black diamond rings. This ring weighs 5.84grams. Because this ring design is made to order we're happy to set White, Blue, or other color diamonds, email for pricing. 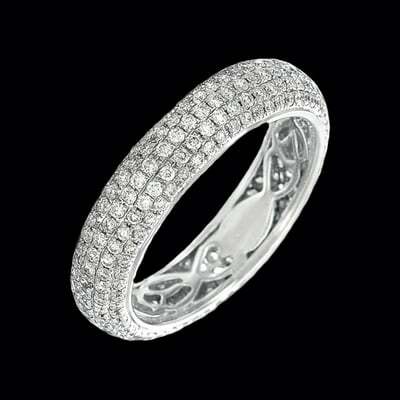 Incredible 14k white gold pave diamond eternity band. Diamonds total 1.36ct tw in this elegant eternity band and are SI 1 clarity G in color. 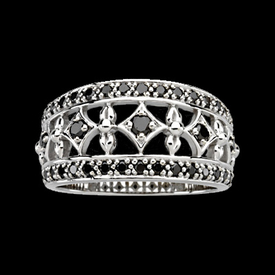 There are 272 diamonds in this great design and of course they go all around this ring. This diamond eternity band is gorgeous, wear it as your wedding band or just because you love the dazzling look of pave diamonds. 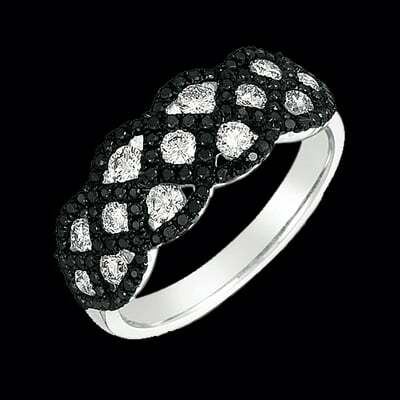 We have many lovely Pave diamond rings. 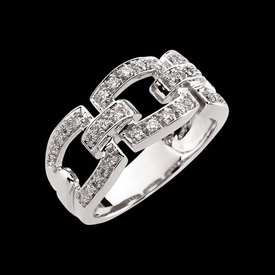 14k white gold criss-cross design diamond ring. Pave diamonds total 5/8ct tw and are I1 clarity. This stylish ring weighs 6.15grams and each diamond measures 1.4mm round. A beautiful ring. Brilliant diamond ring measures 7.8mm across the top. 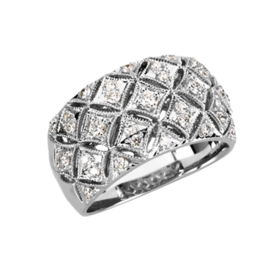 Pretty 14k White gold quilt design diamond ring. Diamonds total 1/2ct tw in this wide old world style diamond band. Diamond shapes are set with diamonds and bordered with a beaded edge. This ring weighs 8.95grams. Stock Size: 6 Additional sizes available. 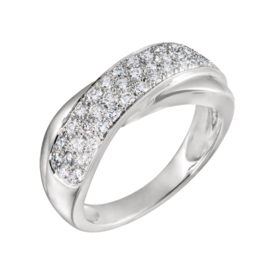 14k White Gold 1/3ct tw Diamond ring. This lovely ring measures 11mm wide. A Great very fashionable ring. You will love this pretty diamond ring. Pretty 14k white gold diamond infinity ring. 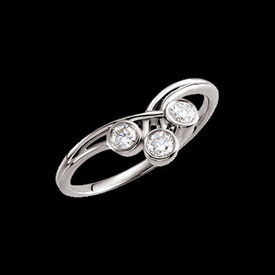 Diamonds total 1/8ct tw in this symbolic loving diamond ring. Special order this design in 14k Rose gold. **Special orders will take 4-6 weeks to complete. Lovely 14k gold 3 stone diamond ring. Unique design is set with 1/3ct tw diamonds, each diamond is a 10 point 3mm round stone. 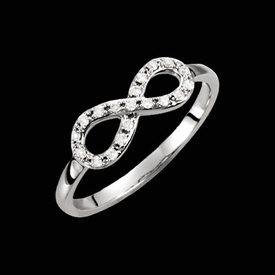 This diamond ring is a beautiful gift. Approximate finger size 7. 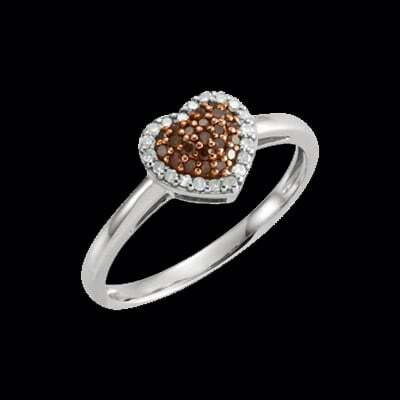 14k White gold diamond heart ring . This sweet heart ring features a chocolate diamond center heart with white diamond heart border. Diamonds total 1/5ctw. Gold rings are intimate pieces of jewelry, symbolizing loyalty, commitment, and everlasting love in marriage. These circular bands of gold have universal meanings that span cultures and time, from one end of the earth to the other. Rings typically adorn a finger and feature metal, plastic, stone, wood, bone, glass, and perhaps gemstones. The custom of rings revolves around wedding ceremonies where the ring represents a circular and everlasting bond. Although all rings hold a similar purpose, diamond rings stand out, especially in modern wedding customs, as diamonds signify steadfast, enduring love thanks to their unmatched strength and beauty. The sophisticated look of diamonds makes them perfect for any outfit, from an elegant cocktail dress to blue jeans. "Diamonds were too rare and expensive for those of lesser means to afford until the discovery of African diamond mines in the 1870s. The De Beers Company was the sole owner and operator of these newly discovered mines in South Africa. In the 1930s, when demand for diamond rings declined in the U.S. during hard economic times, the De Beers Company began an aggressive marketing campaign using photographs of glamorous movie stars swathed in diamonds. Within three years, the sales of diamonds had increased by 50 percent. In 1947, De Beers launched its now classic slogan, 'A Diamond is Forever.' This spurred even more sales. The implied durability of a diamond conveyed the meaning in the American psyche that marriage is forever. A diamond's purity and sparkle have now become symbols of the depth of a man's commitment to the woman he loves in practically all corners of the world. In 1992, the average cost of a diamond engagement ring was $1,500. Today, the average cost is closer to $5,000. Over the years, the most popular cut for diamond engagement rings has always been the round brilliant, consisting of 58 facets that divide the stone into a top and bottom half. Runners-up include the princess cut, the emerald cut, and the oval cut, with the cushion cut quickly gaining popularity as a recent trend." Diamond engagement rings are the most popular accompaniment when men pop the big question. Thankfully, Gracious Rose provides you affordable yet exquisite handmade diamond rings. Let's be practical; you are not the only one out there looking to pull off the most romantic wedding, so it makes sense to take on a competitive mindset. According to the Government's National Marriage and Divorce Rate Trends, over 2.3 million couples wed every year in the United States, which breaks down to nearly 6,200 weddings each day. Statistics do not lie. If 6,200 couples wed every day, what are your chances of getting the one you want at the price you want with that much competition? Thanks to Gracious Rose, your problems are gone. As an online provider of diamond jewelry, Gracious Rose offers a selection of over 3,500 handmade products guaranteed to suit all palates! Even if nothing catches your eye, custom-made pieces are available. Simply tell us about your perfect ring, and we'll make it yours ASAP! When choosing a diamond ring to offer to that special someone, don't settle for second best. You deserve top-notch service and a vast array of selections. Visit GraciousRose.com to learn more about the plethora of elegant diamond wedding jewelry pieces available in all designs, from contemporary to classical. Make your wedding day special by choosing only the best ring. Find your perfect diamond wedding jewelry at GraciousRose.com today!